The platform technology for ceramic nanoporous MicroNeedle Arrays (npMNAs) was invented at University of Twente, MESA+, Institute for Nanotechnology, The Netherlands. The two main distinguishing features of our technology are widely recognized by the industry: we offer ceramic and nano-porous micro-needle arrays. The nano-pores allow for storage of active compounds, such as vaccines, inside the device consisting of micro-needles connected to a backplate. In combination with surface-bound active compounds, a unique release profile can be achieved (e.g. rapid onset and longer duration) by our npMNAs, distinguishing our technology clearly from existing solid microneedles arrays. Once brought into proper contact with the skin, the vaccine diffuses from the nano-pores into the outer skin layers targeting the dendritic cells. The microneedles pierce the stratum corneum and reach into the epidermis and dermis. We offer a technology based on ceramic micro-needles arrays, integrated into a transdermal patch, and properly applied to the skin most likely by a npMNA-integrated applicator patch. In comparison to intramuscular delivery of vaccines, it is expected that 5 to 100 times lower doses are required for intradermal delivery. The delivery of the vaccine will be painless, as the microneedles do not reach the endings of the nerves and blood vessels (these are located in deeper tissue layers). 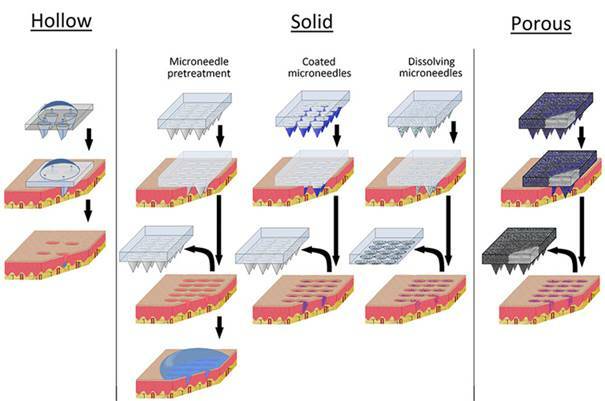 The microneedle patch shall be easy and safe to administer, which makes self-administration by the patient possible. In the field of microneedle technology, the large majority of the technology developers focus on either solid microneedles or hollow microneedles (figure below). Solid micro-needles can be used in various ways: poke & patch (micro-needles perforate the skin and consequently a drug containing patch is applied onto the skin), coat & poke (drug coated micro-needles are applied on the skin for release of the coating), poke & dissolve (drug containing polymer micro-needles dissolve in the skin after administration). MyLife Technologies holds a unique position by offering a poke & diffuse technology: Drugs entrapped in the nano-pores of the micro-needle arrays diffuse into the skin after administration. The poke & diffuse approach gives a unique drug release profile, which can be influenced by the design parameters of the micro-needle arrays and by the excipients in the formulation.